It's finally here! 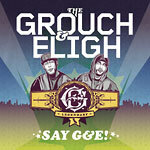 The Grouch & Eligh have bestowed upon us their third collaboration: Say G&E! Some time has passed since their last release with No More Greener Grasses, and among fans it still remains some of their best work, but probably the thing they've been asked most about while doing shows is if they're ever going to release another album. Fan prayers have now been answered, and it's obvious that letting the years go by and taking time off has proved to be a powerful creative ally. Produced almost entirely by Eligh, and if you've heard any recent work by the eccentric emcee you can expect a very dreamy soundscape of beats and relaxing sonic rhythms while often delivering his verses at the speed of light. The Grouch continues to show why he's a rappers rapper, not afraid of any kind of style these days, as seen with last year's Show You The World, and perfectly capable of recapturing the glory days of the Legends with The Gathering, but it is noteworthy that age and a love you can only find through friends and family have helped him grow as a humbled lyricist full of wisdom and a keen awareness of the ever changing world around us. To help mark the return of G&E are guest appearances by Pigeon John, Mistah F.A.B, Slug, Gift of Gab, Blu, and even Sage Francis, as well as additional production by Flying Lotus and Amp Live. Legendary Music is on fire this year, but even if the bus of new releases stopped here...I think I'd be okay with that after hearing Say G&E! But of course, we're still thankful there is plenty more to come! Please note: our current stock of this CD (sent to us personally by Eligh) has a line through the bar code on the back of the digipak. It was just marked with a Sharpie before it was shrink wrapped (the case is not cut or punched and the shrink wrap is intact). Most tracks produced by Eligh. Track 4 produced by Flying Lotus, 5 by Amp Live, 6 by Rick Rock. This album sounds so amazing the beats, the DEEP lyrics, the guest appearances, This album has it all and Eligh just shows off his skills even more here and Grouch too as he is one of thee most inspirational Emcees out in the game. This album surpasses expectations and goes beyond that so do yourself a favor? If you like Hip Hop, True Hip Hop and tired of listening to whack stuff on the radio. Pick this up you will not be disappointed and you will defiantly be saying G&E!!!! You can hear "amplive" in the very beginning of "boom"...can't think of any other reason why it would be there.